This one is dedicated to Bill Gore and all those who came after him like Reid Hoffman and Jeff Weiner. The stress that all organizations are under today is unprecedented. In the last 20 years, two-thirds of non-financial S&P 500 companies didn’t survive. CEOs are being replaced with a rapidity that rivals anything we have seen in the past. Bankruptcy and insolvency is rampant, even for the largest corporations. Some simply shrug their shoulders and mark it all down to capitalism. What is really going on is fundamental change at a pace that leaves many in business confused and in a state of future shock. In 1970, Alvin Toffler, in his seminal work Future Shock, described a trend of significantly accelerated rates of change. He demonstrated how social and technological norms had shorter lifespans with each generation, and stipulated society’s ability to cope with the resulting turmoil and anxiety was doubtful. In past generations, periods of change were always punctuated by times of stability. This permitted the society in general to assimilate the change and resolve its impact before the next change arrived. But these periods of stability constantly grew shorter and by the late 20th century all but disappeared. In 1980, in The Third Wave, Toffler characterized this shift to relentless change as the defining feature of the third phase of civilization which was preceded by the agricultural phase and the industrial wave. He claimed that the dawn of this new phase will cause great anxiety for those that grew up in the previous phases, and cause much conflict and (please take special note) opportunity in the business world. This requires a change in strategic management. Strategic management’s history is varied. Alfred Chandler, promoted an all-encompassing strategy for all the various aspects of management in his ground breaking work, “Strategy and Structure” and later on his Pulitzer Prize winning work, “The Visible Hand: The Managerial Revolution in American Business” in 1977. Peter Drucker, the phenomenally accurate futurist, emphasized the importance of management by objectives (MBO) and predicting the importance of knowledge workers and intellectual capital. Philip Selznick defined the matching of organization internal aspects with the external environment known as SWOT (Strengths Weaknesses Opportunities Threats). We are now in the Learning and Agile Strategy phase where businesses must change their structure fluidly in response to ever changing customer needs and market pressures. Jack Welch says in Straight from the Gut, “Change before you have to”. The need to precede market demands with organizational adaptability, which can anticipate those demands and meet them at the beginning of a cycle, is the difference between enterprise success or business failure. The market turbulence of the last 6 years has clearly shown the influence of globalization and volatility which will remain constant for the foreseeable future. Even with a rebuilding economy, the underlying fluctuations in commodities, currency rates, energy and the emergence of a vast array of new and non-traditional competitors will constantly challenge traditional business and operating models making them obsolete. That is, while there is value in the items on the right, the value the items on the left is greater. The functional organization aspect provides economy of scale advantage and proficiency of expertise while the hierarchical organization promotes clear lines of authority and performance rewarding. Assigning work by product or initiative gives the advantage of promoting team thinking and team work with focus on the success of the product or initiative and therefore the organization rather than the individual. This is not a matrix structure; it is actually the evolution of a hybrid structure that is one step closer to a true latticed web structure or virtual corporation. The hierarchy is the financial and sponsor structure and more fixed. This gives stability. The work structure is highly flexible and environmentally responsive. The key concept is that individual employees report to one structure governing behavior. Teams report to another structure governing work. It does not have the limitation of being able to support only a few products or initiatives. 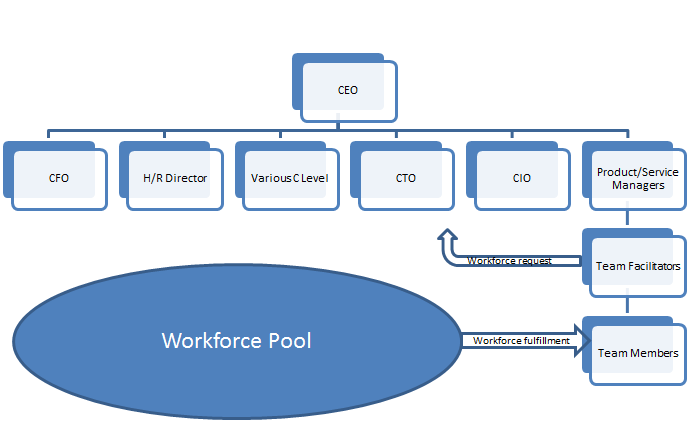 It does require dual planning with the hierarchy supporting the product structure. The functional organizational structure exists as a servitor to the work related one. Performance management for the individual is governed by the manager of record in this structure. All work however, is performed by a product or service structure that is highly latticed or networked. Here performance is monitored at the team level and not the individual person. Success or failure is the joint responsibility of the entire team because it chooses to inculcate itself and then accept responsibilities of individual items of work to accomplish a particular initiative. How are the performance management system assessments divided? Assessments from the hierarchy focus on the behavior of the individual while assessments from the product structure focus on the success of the team. Usually a 50-50 split is the most efficacious. The hierarchy manager conducts the performance management with individual 360 degree input concerning the employee’s behavior and statics gathered from project management and other tools that objectively record the accomplishments of all the teams on which the employee is active. This might seem complicated, but it is not. While it is true that you can have two or even more managers, none of their directions should be conflicting since they govern differing areas. As far as priorities are concerned, the various product or service managers settle any potential conflicts outside of the team setting. As a rule, if you are doing agile you should be focusing on one initiative at a time anyway. Your hierarchy manager is a service manager that works to see that sufficient human resources are available to meet the needs of the product and service managers. If you are following scrum, the scrum master’s role is to facilitate and remove obstacles, not manage the release or iteration. As you can see, the structure is firm where solidity is needed and fluid where responsiveness is required. It can interface with third parties and vendors in a highly organic fashion. In short, it is all things to all people. If this sounds too good to be true, like Bill Gore says you will find some form of this structure working at times very surreptitiously in all successful companies. The extent which this virtual organization identity has to “buck the system” determines how effective it is and usually the company’s success. Executive boards and CEOs need to understand this and gain a new perspective and basis of operation that leads to top management success and continuity. Till next time – keep agile! This entry was posted in Agile and Strategic Planning, Agile Arguments, Agile in the Enterprise, Agile Thinking and tagged Agile, Agile Adoption, Alvin Toffler, Business Agility, Business Management, C Level, CEO, Keeping Agile, Management, Management 3.0, Management Theory, Organization, Organization Structure, scrum. Bookmark the permalink. My experience in the real world has taught me that the real impact and value (and work) of a leader is in translating “should be” into “will be” and then sustaining “is”. Your various managers are unlikely to settle conflicts outside of the team setting unless you have an exceptionally focused organization. And if you have two or more managers, their directions will indeed be conflicting from time to time. This is especially if the organization is changing, growing, or otherwise adapting. What people need from leadership is a strategy and guidance for managing the gap between what should be and what is. Thank you for your comment. We might have some semantic differences, but I see this issue in a different context from your views. The premise of this post is the imperative of having an agile organization structure – if you are going to be an agile organization. I am not sure what point you are trying to make when you say, “Your post has more than a few “if you are doing Agile then you should X anyway”.” I try to provide concrete advice and not just voice vague platitudes. It seems to me that you are referring to the old concept of matrix management when you say, “Your various managers are unlikely to settle conflicts outside of the team setting unless you have an exceptionally focused organization.” By its very nature, agile organizations are highly focused, with dedicated product and service managers and operational teams. When potential priority disputes arise, they are settled at a higher business level and shield the teams from any discourse or potential politics. This enables the teams to stay focused on high levels of productivity and be highly engaged. A number of companies function this way like Google and LinkedIn to name two. Certainly hyper-growth organizations such as LinkedIn have proven this to be a viable business strategy. Finally, good agile teams are always a generator of new possibilities for what should be. It is missing one of the fundamental points of agile to think that strategies for managing the “gap” as you note between ideal and reality need to come from management or leadership. That is an old management 1.0 concept. I have often observed the boundaries of possibilities pushed farther and more successfully by the creativity of the team, than the management that was facilitating their effort. We live in a mixed world of the old and the new. The old concepts of management are constantly loosing ground to the new agile philosophy. It is only a matter of time before they disappear altogether. As a business owner this was a real eye opener for me! It is contrary to everything I learned in business in college and in my early years as an executive, but now that I have my own company it seems to make perfect sense to me to shape it and run it this way. Excellent work Mr. Lucas! Thanks for sharing! Mr. Lucas your article is very informative and poses an interesting challenge to all who are in senior organization positions. Would you be open to a brief discussion on this topic? I have a responsibility to reorganize our corporate structure and I would appreciate the opportunity to gain your feedback on my ideas. This post was exactly what I was looking for! I am heading up a reorganization effort at our company and your concise and logical explanations have cut through a lot of the fog that supposed experts we had hired were creating for us. I like your approach and this single post holds enough information to begin to implement it. Thanks! I will be a follower from now on! A superlative post on the need for a flat organization and how to go about engineering it! This could be the subject of a book, Mr. Lucas. Quite an impressive post Mr. Lucas! Are you open for a few practical questions by email or phone? It’s really good reading! Thank you!